I am sure by now that you have heard of the benefits of Alkaline water. Clearly, an alkaline diet is much healthier than an acidic diet-- in fact, an acidic diet is pro-inflammatory, and is linked with inflammatory conditions such as arthritis, muscle pains, and other degenerative processes. Those that are acquainted with me, know that I am a healthy skeptic, and as such, I was a holdout for a long time-- I mean, H2O is H20 right? Not necessarily. Here is a nifty little machine that electrically separates a portion of the water into H+ (acidic) and OH- (alkaline) ions. Depending on the alkalinity you select, that is what the output will be. The more alkaline is for consumption (thus alkalizing your system), and the more acidic useful for other things, such as cleaning and sterilizing counter surfaces, etc. The unit to the left is the one that I own and use, the LeveLuk-R, and we have been impressed. 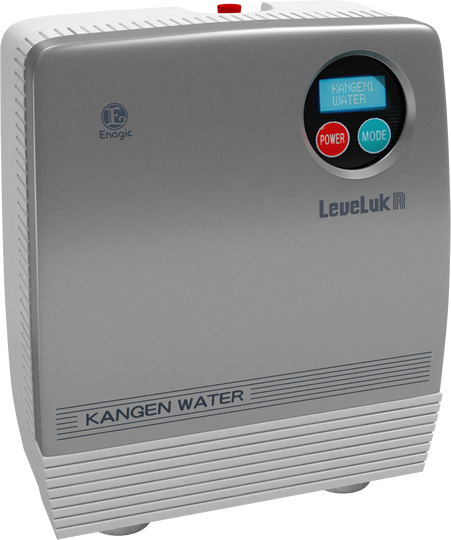 Kangen has even more versatile versions of this machine. Click the link below for more information about the uses and benefits of this alkaline water, and see the other options available. If you would like to experience the benefits yourself, let me know and I will set you up with some water to try. "Change your water, change your life".